It seems like yesterday that we reviewed the inaugural Samsung Series 5 Chromebook running Google's Chrome OS, an operating system for laptops based on Chrome. It was, from the start, a world in which everything from music playback to document creation happened in browser tabs. Since we last checked in a year ago, Google has addressed some early complaints -- the browser can actually stream Netflix now! -- but it's only just getting around to ticking off some other long-standing grievances, like multitasking. 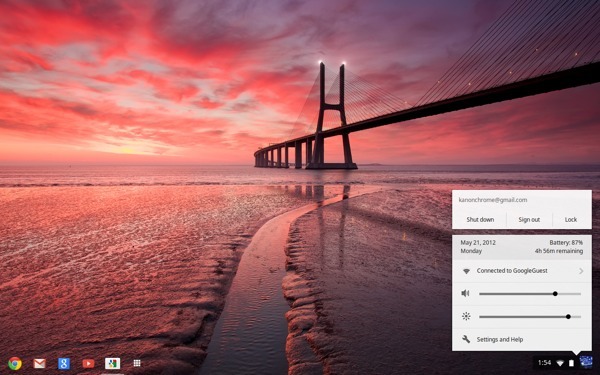 The company just announced two new Chrome OS devices -- the Samsung Chromebook Series 5 550 and Chromebox Series 3 -- and both run a spanking-new build of the OS that ushers in a simplified desktop with customizable wallpaper and the ability to minimize, maximize and close windows -- oh my! More importantly, you can now view multiple windows onscreen, edit docs offline and pin shortcuts to the bottom of the screen -- a combination that promises some seriously improved multitasking. Other goodies: built-in Google Music, Google+ and Hangouts, along with a basic photo editor, redesigned music player and enhanced remote desktop app. So does all this add up to an upgrade meaty enough to make the skeptics give Chrome OS a second look? Could it be time for you to get the low-tech person in your life a Chromebook? Let's see. The latest version of Chrome OS is more pleasant to use, with improved multitasking features, offline doc editing and a built-in photo editor. It should be a welcome update for existing users and schools issuing Chrome devices to students. Until today, it's been tough for even Chromebook sympathizers to defend Chrome OS' status as a bona fide operating system. After all, in its earliest incarnation it was little more than the Chrome browser itself, gussied up with a media player and a fledgling app store. Now in its nineteenth version, though, it's finally getting a desktop, making it look and function a little more like a traditional OS. 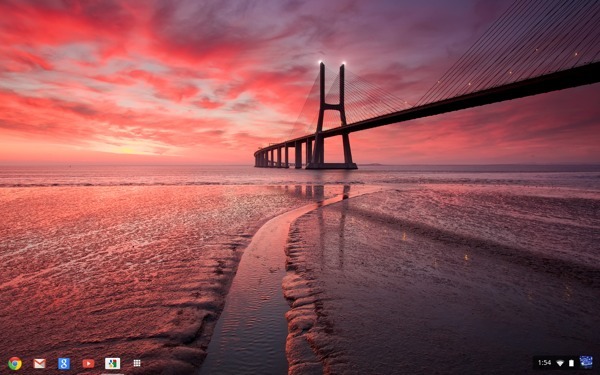 When you sign in for the first time, you'll see an expanse of wallpaper, with a row of apps pinned to the bottom of the screen -- not unlike the Taskbar in Windows 7. By default, you can see that tray of shortcuts even when you have a window open, but when you maximize it (more on that in a moment) the window takes up the whole screen, obscuring the row of apps at the bottom. If you like, though, you can go into the settings and set any given app to always be on top (or, if you prefer, always hidden). The Chrome team has also borrowed a bit from Android: in addition to pinned apps, that tray is home to an app launcher, which looks exactly like the one used on Google's mobile products. Click it and whatever windows you have open will minimize, with a grid of large icons taking up the whole screen. You can click on these, naturally, or use the arrow keys if you want to give the trackpad a rest. To each his own, of course, but we'd much rather open apps this way than by scanning around for a bookmark in the browser. Time savings aside, the new design simply feels more intuitive: though everything from email to photo editing still takes place in the browser, just knowing there's something behind that window makes the experience feel a little more familiar. For every feature that Google has added, there are two more that remain unavailable. So that's the first piece, this space that resembles a traditional desktop. What really makes this feel like a conventional OS, though, are the windows: you can now minimize, maximize or close them! Exciting, right? And, if you're feeling really frisky, you can pull a window and snap it into place so that it takes up half the screen -- again, similar to what you can do in Windows 7. You can also resize the windows and pepper the screen with as many as you can fit. Okay, okay, we're making good use of sarcastic italics, but we do have a point: we take such things for granted to the point where it might not have occurred to naysayers that just being able to minimize a window could make an operating system more user-friendly. And it really does. 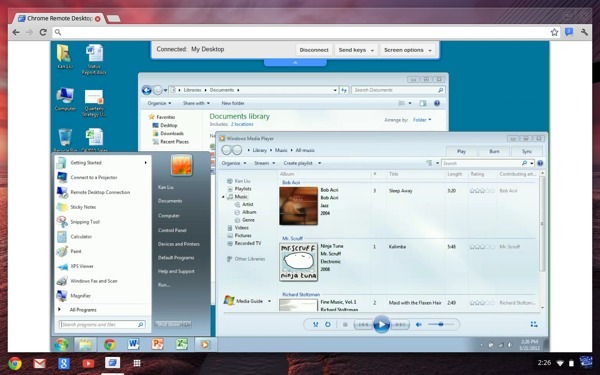 Minimizing windows or even having two on screen at once allows for far more efficient multitasking than earlier versions of the software. And yet, this doesn't feel quite like a desktop: for every feature that Google has added, there are two more that remain unavailable. Although you can change the wallpaper, for instance, there are no Android-style widgets, and you also can't populate that space with shortcuts to things like webpages or documents in progress. Ditto for that row of apps at the bottom of the screen: though you can use it to launch apps, you can't jump straight to frequently visited web pages or a playlist in Google Music. When you click the Chrome icon, it opens up a new tab, instead of bringing you to the one you were looking at last, which makes multitasking feel a little more tedious than it should. There doesn't appear to be a way to change this, though you can change how Chrome behaves when the machine starts up: it can pick up where you left off, open specific sites or just start fresh. When Chromebooks debuted last year, one of the most common complaints was that they'd be useless without an internet connection. "How am I supposed to check my email on a plane without WiFi?" people would ask. "What about accessing Google Docs in a dead zone?" Even a year ago, Google was promising offline access, and eventually it arrived-- albeit, in a crude sort of form. Since last summer, users have been able to read (but not edit) their Google Calendars and Docs even when they've lost their internet connection. We're still holding out for anytime calendar editing, but as of today, people can at least edit their docs offline. First, though, let's take a step back and talk about what kinds of offline apps are available, and how to discover them. To make them easier to find, Google's added an offline category under the "Collections" tab in the Web App Store, though searching with the keyword "offline" should do the trick too. That's how we found Offline Google Mail. To set up Offline Google Docs, though, we had to open Docs in the browser and enable offline access in the settings. Other apps available in the Web Store: a Wikipedia reader, dictionary and solitaire, among lots and lots of other third-party offerings. The problem, though, is that offline Mail and Docs are only as useful as the content you remembered to sync while you still had an internet connection. You know how if you're out of range, your smartphone will download a limited number of emails and tweets, making it impossible to search your entire inbox or scroll infinitely backward in your Twitter feed? It's the same limitation here: that list of emails hardly goes on forever, and you can only search what's there. Even if you took the time to let it sync before you went off the grid, you can only download emails from within the past month (the settings menu also lets you narrow that list down to messages from the last week or two). In essence, then, you're still out of luck if you want to find that TPS report you submitted last January. If it's any comfort, though, company reps say Google Drive integration is coming in the next release, due about six weeks from now. Of course, we haven't yet gotten an early hands-on peek at this feature, but we're told Drive will be baked into the File Manager, specifically. From there, you'll be able to save or copy files into Drive, as well as open Drive files on your Chrome device. Another tidbit: Google has given us a heads-up that users will need to "pin" files they want to make available offline. In other words, don't expect everything you backed up to automagically appear in your Chromebook's File Manager. One of the early complaints about Chrome OS was that it couldn't even support Netflix streaming. Though Google fixed that last summer, it's only now adding support for 1080p YouTube videos. We say better late than never: we found the streaming to be quite smooth, whether we watched a professionally done animated short or some amateur home video. We also had an easy time gobbling up clips on Vimeo and Hulu, and you can also view movies from Google Play, if you're so inclined. It was at the annual I/O conference last year that Google unveiled both Chromebooks and Google Music, so we can see why the company chose not to integrate those two brand-new pieces of software from the get-go: after all, it would be another six months until Music even made it out of beta. Now that another six months have passed, though, Google was clearly ready for the service to be a built-in part of Chrome OS. And by "built-in," we mean Music is one of several shortcuts that come pre-loaded in the app launcher. If you've ever played with Google Music, the interface should look familiar. And, as ever, you'll need an internet connection to use it. Though Chrome OS' built-in media player lets you play music stored on an SD card, there's no such thing as offline Google Music. Luckily, a Google rep confirmed the company's working on letting users pin specific songs so they can listen anytime. Tying it all together is a redesigned media player, which, as always, you can park in the lower-right corner and set to stay visible as you chat, read emails, et cetera. While it's cleaner-looking, it's still lacking any advanced features: no looping, for instance, and no shuffling of tracks. Additionally, the list of supported file formats has expanded to include support for all Office files (doc, xls, ppt, docx, xlsx, pptx), rar, tar, tar.gz (.tgz), and .tar.bz2 (.tbz2). As it is, the built-in media player could already open .zip, .txt, .html, .mp4, .m4v, .m4a, .mp3, .ogv, .ogm, .ogg, .oga, .webm and .wav files, along with PDFs and "common image formats" (read: .jpg, .gif and .png). Another common complaint about Chrome OS is that it isn't so great for creating visual content -- and frankly, it still isn't. It would seem, though, that Google is at least taking baby steps in the right direction. New with this version of the operating system is a photo editor, with options to auto-enhance, crop and rotate shots, as well as adjust the brightness and contrast. It would've been nice if Google could have just folded some of those neat Picnik filters into the photo editor, but we can see where that wouldn't be at the top of the engineering team's priority list. Hopefully, more advanced tools like that will indeed arrive in some future build. As you're editing, be sure to click the link that says "keep original"; the OS doesn't automatically save the untouched version (Google says it expects most users will want to overwrite the original if they're only making small touch-ups). When you're done, you can upload to Picasa and get a link to pass around to your friends. The ability to send edited photos to the likes of Facebook and Twitter would be nice too, but again, baby steps. Not new, but worth repeating: you can go to the Web Store and install Google Play Books so that you can read e-books offline. Continuing that offline theme permeating this review, it's possible to download a book so that you can read it even when you lose your internet connection. To do this, hover over a book's thumbnail in the Play Store and check the box that says "Make available offline." Obviously, we can't vouch for your internet connection, however poky it may be, but over a reliably strong WiFi network we were able to download "Pride and Prejudice," a 448-page book, in under a minute. 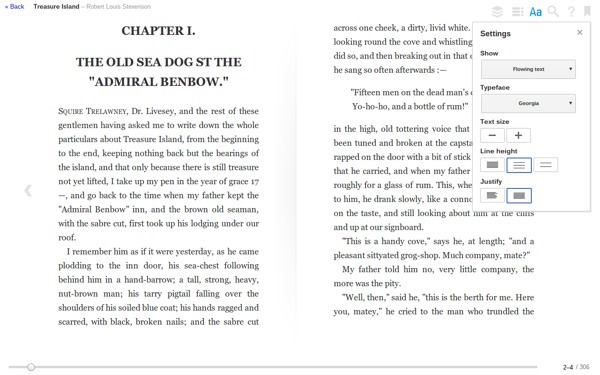 Once you've gotten that over with, it's the same Google Books interface you already know, with a search feature, table of contents and the ability to adjust the typeface and font size. Naturally, if you close out of the app to do something else, Google Books will remember where you left off. The first time we tested a Chromebook, Google+ wasn't even an official product yet. Less than a year later, it's taking its predictable place in Chrome OS, with separate apps for the social network, as well as Hangouts, the video chat service. Interestingly, Hangouts is one of the rare instances in which opening an application will cause Chrome to launch a new window -- not a new tab, but a new window. 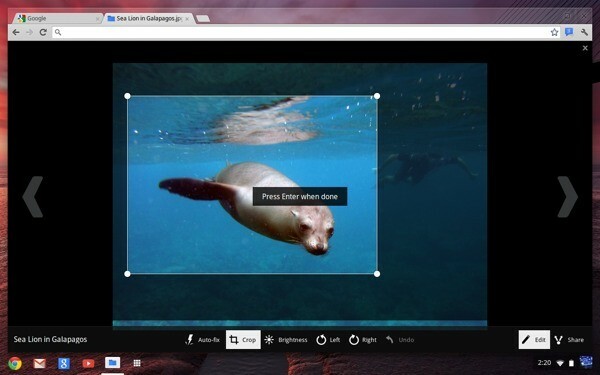 Google+ looks exactly as it would in any other browser, so we'll spare you the recap. Starting a video chat, meanwhile, is idiot-proof: there's one field for naming your Hangout, and another for searching for names of people to invite. 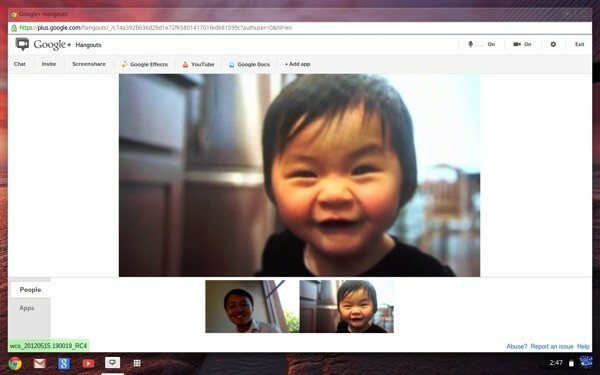 Whether you normally use the service or not, it's a nice improvement over the state of affairs a year ago, when the only option was a video call inside GChat. Want Skype? Sorry, folks, but surely you know a few people with Google accounts, yeah? You can now reach into whatever PC you left at home, and see files you don't have stored online. Chrome Remote desktop, introduced as a beta last October, is what it sounds like: an app that lets you access other devices, and also share your screen with others. Like other Google apps, you'll find it in the Chrome Web Store. Regardless of whether you're using a Chromebook, Mac, PC or Linux machine, you'll have to download it from the Chrome Web Store. Until now, the setup process was a clumsy affair, requiring Remote Desktop to be installed on both devices and for the person sharing his or her desktop to generate a 12-digit code and pass that on to whoever wants to access the machine. Because this password changed every time you did a screen-share, you needed someone else on the other end, giving permission to share their computer and then passing along the code. Once you carried out that little authentication dance, you could expect a fast connection with little latency between the two machines. In particular, you could access Skype, FaceTime and Colloquy -- apps that wouldn't normally be available on Chrome OS -- though taking control of a friend's PC or Mac to borrow his applications isn't exactly a realistic scenario. If anything, the technology was useful for troubleshooting, which you might well need to do if you gift your Chromebook to the low-tech person in your life with simple needs. Now, you can use your Chrome OS device (or any PC running Chrome, really) to access one of your own computers remotely, without help from someone else. For now, at least, the host computer has to be running Windows Vista or higher or Mac OS X 10.6 or above (sorry, Linux users). 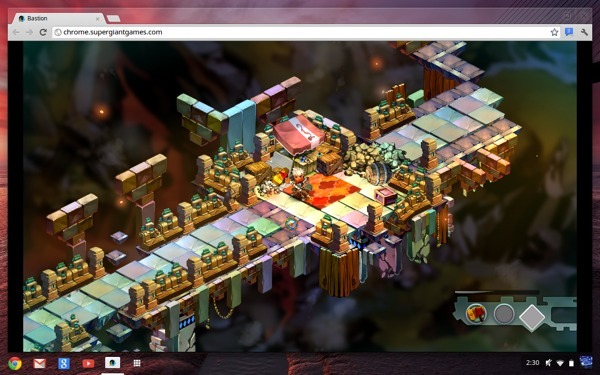 To get started, you'll need to follow a few one-time steps: go to the Chrome Web Store on both your Chrome OS device and host machine, and make sure you've installed the latest version of Remote Desktop as a Chrome browser app. Then, you'll be prompted to download a host installer to enable remote controllers. Finally, choose an access PIN for that particular machine. Once you've done all this, you'll be able to see your other computers on your Chrome OS device; it doesn't matter if they're not in the same room or on the same WiFi network, so long as that host machine is turned on. And all you'll have to do to log in is enter that PIN you configured during the setup process; no more randomized 12-digit codes here. The beauty in all this, of course, is that you can now reach into whatever PC you left at home, and see files you don't have stored online, or on your Chrome OS device. If you've used the Web Store recently, there's nothing to see here: Google hasn't changed the user interface at all this go-round. A company rep did give us an update on the selection, though, and told us there are now "tens of thousands" of Chrome-optimized applications available, including "hundreds" of offline options. For those who've managed to avoid the Web Store up until this point, here's a quick primer: on the home page, you'll be greeted by a bottomless list of apps, each represented by tiles of various sizes. Since you could stumble across every application in the store if you scrolled down persistently enough, you're better off selecting from one of the categories listed along the left-hand side (think: business, productivity, etc.). In that same pane, you'll find a link to see just the apps you've installed, along with categories for popular and trending. Here, too, is where you'll find those so-called collections, which are listed separately from the various categories of apps. When it comes to day-to-day web browsing, not once did we encounter Google's equivalent of a Fail Whale, those cheerful "Aw, snap!" and "He's Dead, Jim" screens. No sites caused Chrome to crash, and we had a smooth time juggling tasks in different tabs. We also found the dual-core Celeron processor inside both the new Chromebook and Chromebox were enough to assist with speedy boot-ups and app launches. Not all was well, though: two Engadget staffers testing the Chromebook and Box noticed that the two machines can be sluggish in reconnecting to known WiFi and 3G networks after resuming from sleep. On the multimedia front, we noticed a good deal of tiling when watching an .mp4 movie. Finally, our own Myriam Joire, who reviewed the Chromebox, found that after putting the computer to sleep, she was logged out of Google Apps accounts, as well as Facebook and Tweetdeck -- and this is despite checking "keep me logged in" on these various sites and giving Chrome permission to remember these passwords. A Google rep told us the engineering team is aware of that particular kink and is working on a fix. 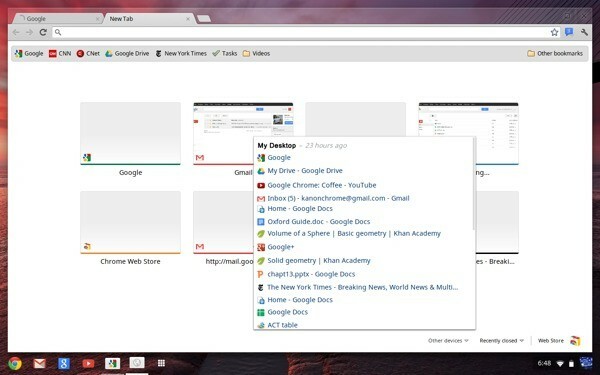 One new feature that's worth noting but that's neither here nor there is the ability to sync tabs between your Chrome OS system and your Android device -- assuming it, too, is running the Chrome browser. Moving on to security, there haven't been any major changes this time around. You can still set your device so that a password is required when the system wakes from sleep. There's also sandboxing, TPM, data encryption and verified boot, among other protocols aimed at businesses and schools planning on issuing these in bulk. Wrapping up, you can still print things through WiFI-enabled printers that make use of the Google Cloud Print standard. It's worth mentioning, though, that a year later this standard has become far more ubiquitous, and it's a lot easier to find a compatible printer than it was even a year ago. When we reviewed the first Chromebook a year ago, we concluded that Chrome OS isn't for everybody. If you need certain desktops apps like Photoshop even when you're on the go, you're never going to appreciate what Google's trying to do here; there will always be some hole in your workflow that keeps you crawling back toward your PC. By design, Chrome OS is at its best when the user has always-on connectivity, which means for the foreseeable future, at least, it's destined to remain something of a niche concept. The good news is that Google's taken a half-baked, experimental product and done an admirable job of fleshing it out. After spending a few days testing the software, we can confidently say that multitasking is a lot easier when you can view multiple windows onscreen at once, and when you have shortcuts pinned to the bottom of the screen, below the browser. It's also hugely helpful to be able to edit documents offline instead of just view them. Ditto for being able to read books offline, or use Hangouts for video chat instead of the calling feature built into GChat. And it could be even better: it would be nice to add shortcuts to docs, books and other things to the desktop, which currently amounts to a lot of blank, unusable space. More sophisticated photo editing tools would be welcome, and we'd love to be able to share photos to sites other than Picasa. 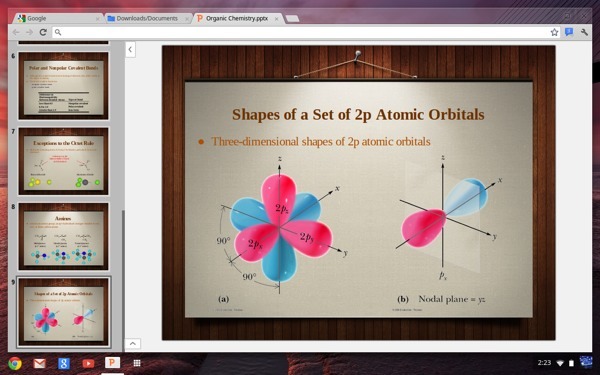 Even without these things, version 19 marks a welcome update for existing Chrome OS users, and should suffice for the classrooms that are already issuing Chrome devices to students. 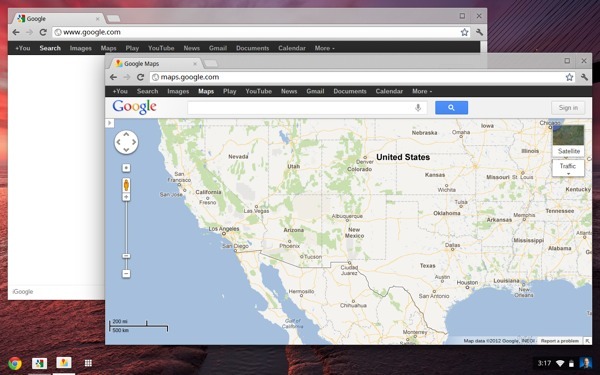 Heck, it might even be time for curious early adopters to give Chrome OS a second look. But as Google starts selling more Chrome devices in retail, we have a harder time believing many consumers will be ready to put up with these limitations, especially as tablet apps grow more sophisticated, and as we start to see Transformer-like Win8 devices with touch-friendly apps and physical keyboards. Even Ultrabooks are starting to come down in price, and offer some of the features that have made Chrome OS devices appealing, such as fast resume times. Given how many affordable portable devices there are to choose from, Chrome OS might have the best shot at catching on if companies like Samsung would relax the price of their wares. Myriam Joire contributed to this review.